Cabrillo I is located in the South Coast region of California, in Cabrillo National Monument. The site is located within the Cabrillo State Marine Reserve. This site recieves approximately 150,000 visitors per year, and is patrolled by volunteers of the National Park Service who educate visitors and enforce no-take regulations. The Point Loma Waste Water Treatment Plant is a short distance to the north, though the outfall is more than three miles offshore and is not thought to be a regular source of pollution for this site. Cabrillo I forms the upper end of a steep visitation gradient with Cabrillo 3. This gently sloping site consists of moderately uneven terrain, containing few cracks and folds. Cabrillo I is dominated by a mixture of consolidated sandstone, mudstone, and granite bedrock and boulder fields, and the area surrounding the site is comprised of a mixture of consolidated bedrock and boulder fields. There is a small sandy beach at the southern end of the site. The primary coastal orientation of this site is west. Long-Term Monitoring Surveys at Cabrillo I were established in 1990, and are done by Cabrillo National Monument. Long-Term MARINe surveys currently target the following species: Chthamalus/Balanus (Acorn Barnacles), Tetraclita (Pink Barnacle), Pollicipes (Goose Barnacle), Mytilus (California Mussel), Silvetia (Golden Rockweed), Egregia (Feather-Boa Kelp), Red Algal Turf, Phyllospadix (Surfgrass), and Pisaster (Ochre Star). In addition, water temperature is monitored at this site. Click here to view Long-Term trends at this site. Biodiversity Surveys were done by University of California Santa Cruz in 2002, 2004, 2009, and 2013. The Biodiversity Survey grid encompasses one section that is approximately 30 meters (along shore) x 40 meters (seaward). Click here to view Biodiversity Survey findings at this site. 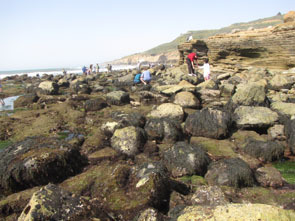 Click here to view the Cabrillo Rocky Intertidal Monitoring Program 15 year report (1990-2005). For more information about Cabrillo I, please contact Keith Lombardo.